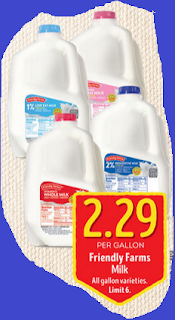 The Aldi Spot - Helping You Save: ALDI Milk Sale - 1 Gallon $2.29! This week ALDI has their gallon milk on sale at $2.29! Our kids have been drinking the ALDI Friendly Farms milk for years, and we are thankful for the ALDI's -milk farmers' pledge to not use any artificial growth hormones. The ALDI Milk Sale is valid from September 21 - 27, 2016. How much milk do you buy each week for your family?